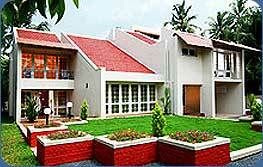 Alleppey Accommodations Where are you going to stay in Alleppey? 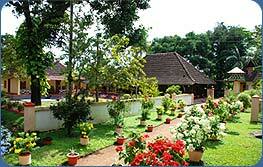 Island resort situated on the on the backwaters of Kerala just 14km South of Alleppey. We have, experienced that small boating facilities so that they can sail down the narrow canals which are not accessable to the larger type houseboats. Our guest can sail, take walks or cycle along the many pathways along the banks or walk through the rice paddy fields to enjoy the country side & meet the friendly smilling local people. Sailing on the backwaters can be joy to bird lovers & before sunset hundreds of bird can found perching in the tree on the island. House made of green leaves where the rishis of ancient India lived. 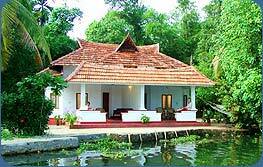 Our ancestral country home with its 19th century architectural grace is situated in KUTTANAD. Most part of the house is made of teak-wood with fine carving works which still retains well.The house is constructed according to the “Vasthu Sasthra“.The surroundings full of trees, ponds and narrow canals, carefully maintained with out disturbing the natural beauty. Main attraction of the home stay in we are giving the opportunities to the clients learn how to make Kerala handicrafts ,enjoy Kerala Traditional Music & study how play music instruments . You can see some fine wood carvings and some completed techniques in teak-wood done by the house owner absolutely unique and rare. The Town House has exclusive rooms set with excellent Amenities to put you up in total comfort and pleasure. Sleep in absolute privacy accorded by our well-appointed rooms. Feel refreshed by the cool setting of our air-conditioned rooms and wake up to the all new world offline hospitality. Have unto yourself the exclusiveness of your room privacy and give yourself a shower both in the en suite bathroom. Choose hot or cold running water as you prefer at your convenience. Day: 01 pick from Alleppey Railway station drive to Beach home stay in Alleppey (Auto Rickshaw), meet the Family members. Over night stay in beach home stay. Evening spent with Arabian Sea with Candle Light dinner. Day: 03 after breakfast houseboat drop at 09: 00 Am, A canoe will pick cruise through backwater, check in the backwater village home stay, Main Attraction: - you can learn how to make handicraft, lesson Kerala Instrumental Music & songs, walking through paddy fields, fishing, silence, village walk & over night stay in the home stay. Day: 04 after breakfast, canoe or Auto Rickshaw pick from backwater home stay, cruise through backwater, 1 Cruise through backwater, and check in Island home stay. Attraction: - Island home stay, silence, Fishing, bird watching, village walk , paddy fields, fishing & over night stay in the resort . Day: 05 after breakfast canoe or Auto Rickshaw pick from the island resort, Coir Factory Visit, Museum, Alleppey beach then back to Alleppey Rail way Station. Day: 02 stay continuous. Day full spent in the island home stay. Fishing, bird watching, village walk, boat trip are the activities we offered. Day: 03 after breakfast drive to Cochin After drive to see in Dutch palace, Dutch cemetery, Tomb of Vasco Da Gama, Dutch Mansions, Churches, Jewish Synagogue, and Jew Street. Drop at airport with everlasting memory of the Island home stay. Over night stay in the hotel. Day: 01 pick up from Cochin Airport drive to Alleppey. Check in the beach home stay. A full spend with family members & enjoy special dishes & sun set in the beach Over night stay. Day: 02 after breakfast, drives to backwater place go for 4 hrs canoe trip to Alleppey backwater. Visit Ambalappuzha Temple. After back to beach home stay. Do some body treatment & Bakery Items (on Demand) over night stay in the beach resort. Day: 03 after break fast drive Cochin Airport with ever lasting memory of Beach home stay & time that spend with the family. Day: 02 after breakfast drive to Auto Rickshaw pick from the backwater village home stay, drive to Alleppey, check in home stay meet the family members, study how to make South Indian Food, 04 Pm Auto Rickshaw Will pick from the resort move to Alleppey beach, enjoy your evening, 06 :30 Pm will pick & drop you at home stay. Day: 03 after breakfast Auto Rickshaw pick & drop to backwater place, daily backwater Trip, canoe Group tour with Traditional Kerala Lunch, trip ends at 05:00 Pm & drop to the home stay. Day: 04 after breakfast canoe or Auto Rickshaw pick from the island resort, Coir Factory Visit, Museum, Alleppey beach then back to Alleppey Rail way Station.